Preschool series about farms. Storm visits a farm with unusual helpers - robots! She also helps look after donkeys, and we learn about glass recycling. Browse content similar to Farm Cats and Robots. Check below for episodes and series from the same categories and more! Hi, I'm JB and welcome to Down On The Farm. so we make sure they have plenty to eat. While I get food for the cows here, let's see what Storm is up to. He has over 200 cows on his farm. And I'm going to help him today. Thank you, but I thought I was here to help with the cows. -We've got robots helping us with the cows. Yes, they do lots of things like milking and feeding. I can see from my phone if anything needs doing. -Some cows need milking now. Well, I am all ready to help out with some milking. There's no need, the robot does all the milking work for us. I may as well take these off then. and the robot's arm swings underneath it. and the robot milks the cow. It must be really helpful to have all these robots around? Yes, we don't have to get up so early and we have lots more time. We spend it checking on the cows, feeding them and bedding them down. Ben puts silage down for the cows to eat every day. This is where we feed the cows. Sometimes it can get quite messy. -I'm happy to help clean it up. We have a robot to do that. It's a silage pusher. the bottom spins around and pushes the feed closer to the cows. -Does it not bump into anything? so it knows if it's going to hit anything and stops. I used to use a tractor to do this job, now the robot does it for me. the robot has reached the end of the route. Then it returns home and recharges its batteries. you must have robots to help you clean up all this poo? -Not yet, I'm afraid, Storm. That's where you can help me. Now, let's find out what ducks do at this time of year. Winter can be the best time of year to see wild ducks. to find food, joining ducks that live here all year round. have their smartest feathers at this time of year. displaying their colours and calling noisily. with its tail in the air, it's a type of dabbling duck. to find weeds to eat. Mallards like this one are dabblers. Others, like these tufted ducks dive right down to the bottom to feed. for small creatures to eat, like pond snails. making it hard for ducks to collect food. or fly off to find somewhere warmer. and I'm really excited, because I haven't met many before. Jess and her helpers are looking after the donkeys today. The black and white one is Madoc. There's lots to do to keep them healthy in winter. First, we've got to groom the donkeys. So, why do we have to brush the donkeys? To get rid of mud and dirt. -And so they look nice and clean and tidy. His coat is really thick. they stay inside the stables to keep warm and dry. There we go, all clean and tidied. So, what's next? Now we are going to go and pick Coco's hooves. We have to check the donkey's hooves every day in winter. To make sure there's nothing in the hooves to make it sore. -What do you think Jess looks for? from each of Coco's hooves. I use a special tool to pick out the donkeys' hooves. -we can take some of the donkeys for a walk. It's Coco and Arthur's turn today. when they spend a lot of time inside. it's back to the shelter. Well, I've had an amazing day helping to look after these donkeys. Now, it's time for a frosty winter poem. I wish it would stay, but melt it must. Lots of animals help farmers. Horses pull trailers and dogs round up sheep. and the cats that help on her farm. -I hear you have some really helpful cats. Yes, we do. We have nine cats on the farm. and they have a very important job. -And what do they do? and we have to stop them. The cats help us by catching or scaring them away. -give them some food to eat. This cat is a feral cat. He was born without a home or anyone to look after him. He was rescued and brought here to keep him safe. Today, we have two new rescue cats coming to the farm. -Can you help us get everything ready for them? When the cats first arrive, they stay in a pen inside a barn. This helps them to settle in before they meet the other cats outside. -It's safe and warm in here. -Is there anything else they need? This straw keeps the pen warm and dry. And the cats will have a cosy place to sleep. There's some water to drink, too. -Yes, and the cats are about to arrive. Great, I'll go and meet them. This is Hayley. She rescues feral cats and finds new homes for them. -Well, we've got everything ready for these two. Great, let's get them inside. OK, guys, we've got the cats. So, we need to be nice and quiet so we don't scare them. Oh, look, he's popped straight into his new bed. Hayley, how long before they can start looking for mice? About two weeks, once they are used to the farm. We'd better leave them to settle in. in the darker winter days. It's fun to play outdoors and go for walks. In winter, it gets dark early, so make sure you can be seen. and take a torch when you're out and about. but what happens to it next? ..and to show us around is Ryan. and put onto a long conveyor belt. to remove rubbish which is not made from glass and we do this by hand. then the glass is dried in a big dryer ready for separating. we end up with this. This is called cullet. It now goes away to another factory to be remade into new glass bottles. with other materials, in a big furnace. The melted glass is cut into small pieces called gobs. Each gob has exactly the right amount of glass to make one bottle. just like blowing up a balloon. The new bottles are reheated and cooled down slowly. This makes them really strong. The bottles are sprayed with a protective coating. Finally, after being checked, the bottles are ready to be used. they are melted again and made into new bottles. because it can be recycled over and over again. Storm and I have had a great time on the farm today. go to the CBeebies website to play the Down On The Farm game. See you next time. Bye! Storm visits a farmer who has some very unusual helpers on his farm - robots! JB meets two cats who are moving from the city to the countryside to live on a farm. 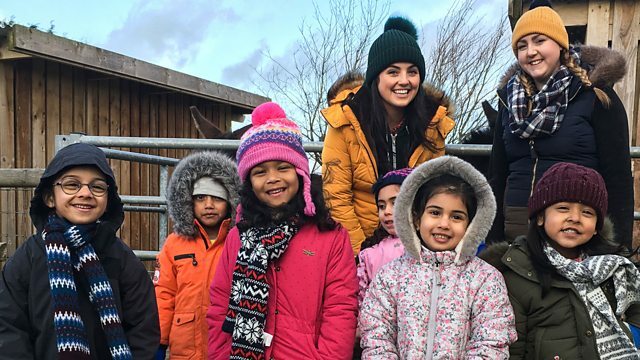 Some children in Wales show Storm how to look after donkeys in the winter, and we discover why glass is a recycling superhero. Finally, JB shares a frosty winter poem.